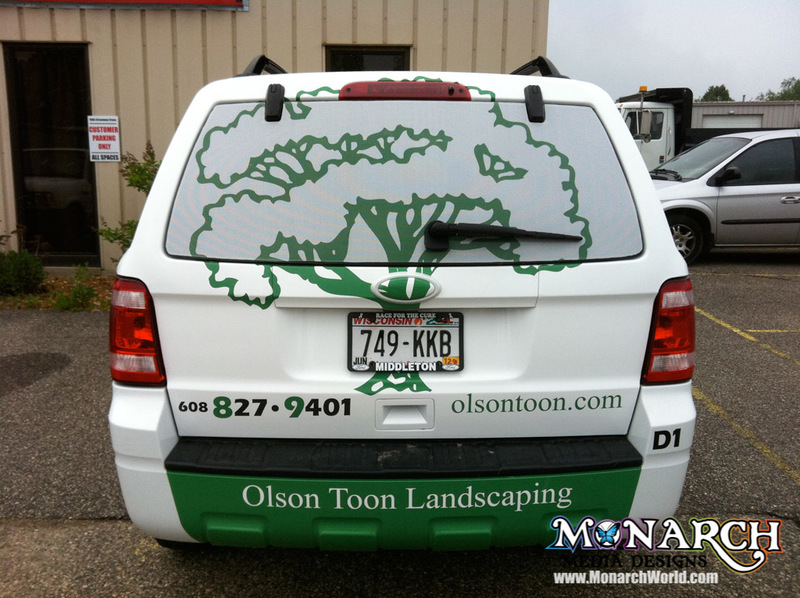 Monarch is your #1 Choice for High-Quality, Professional Perforated Window Graphics for Vehicles in the Madison, WI Area. 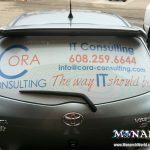 Perforated Window graphics on a vehicle allow you to have graphics on the outside of the window, while also being able to see from the inside. 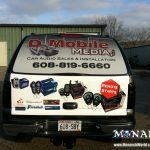 This is an effective piece of marketing that can be added to full vehicle wraps, or just wrap a rear window or side windows to advertise your business. 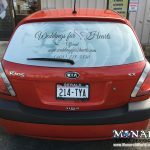 What is perforated window vinyl? 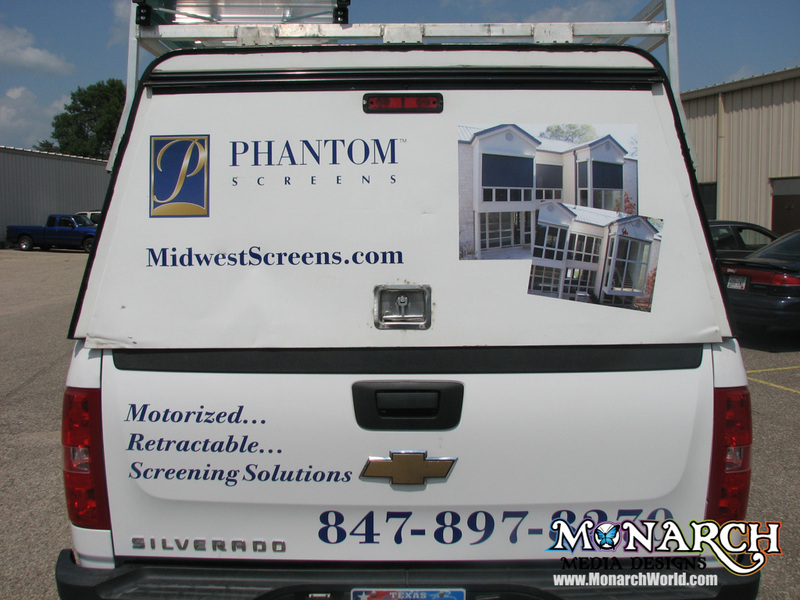 Perforated window vinyl is more commonly known in the sign shop industry as “window perf”. 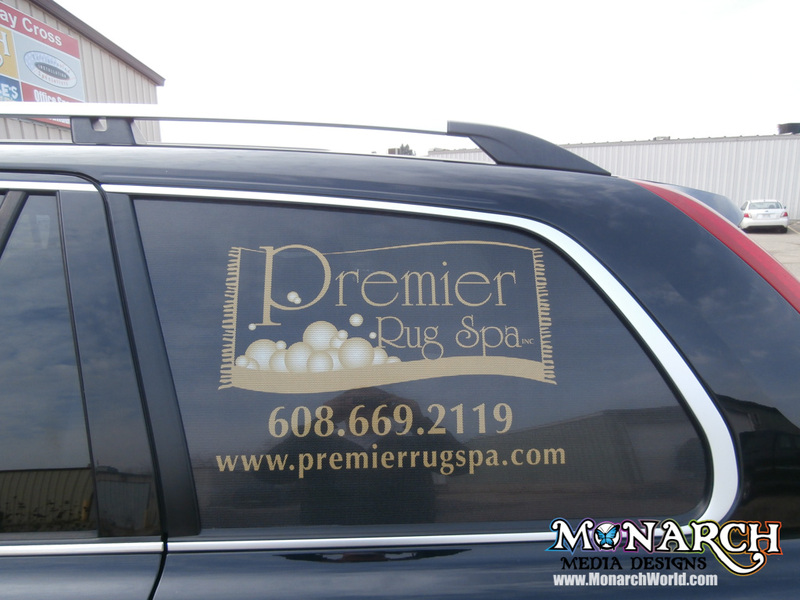 It has the same adhesive qualities of standard vinyl, however it has tiny holes in it that allow you to see out. 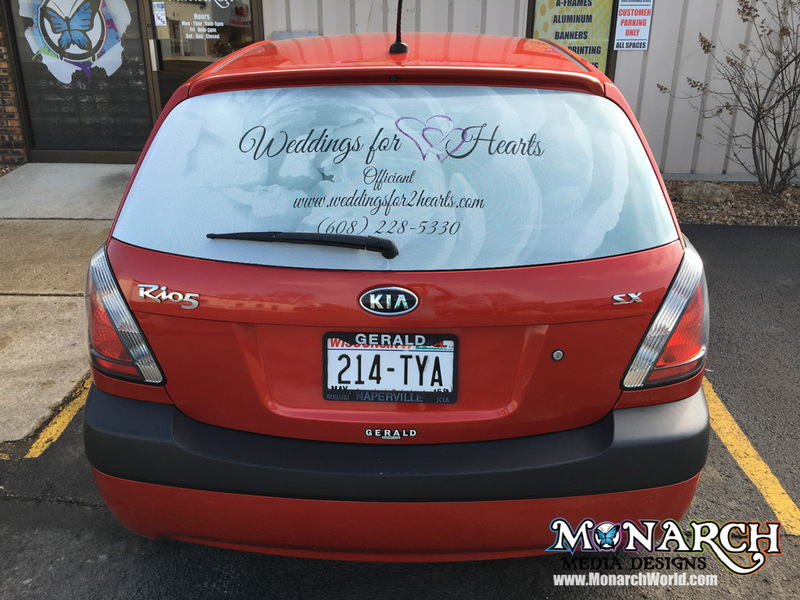 When you are looking at the car from the outside, all you notice is the design. 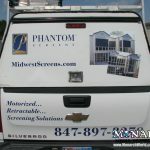 Are the perforated window graphics see-through? Yes! 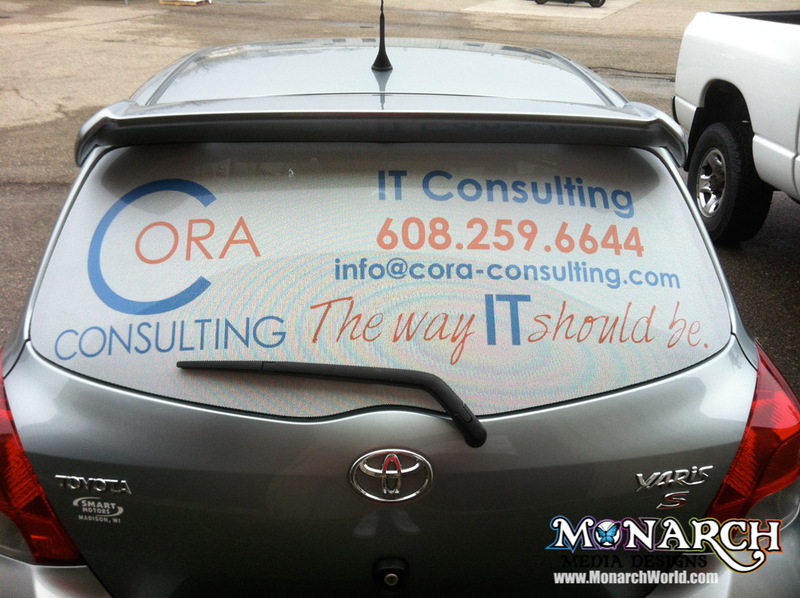 With the window perf, the tiny holes are cut to a side where most of your graphic will be visible, while giving you enough vision to see out the back when you need to. 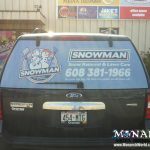 Standard hole size for vehicles is 50/50, which allows for viewing within state laws. 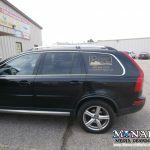 If you are sitting on the inside of the vehicle, the window might look a little tinted, but you can see out just fine. 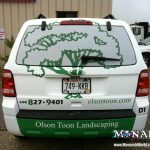 What are the benefits of a vehicle window graphic? 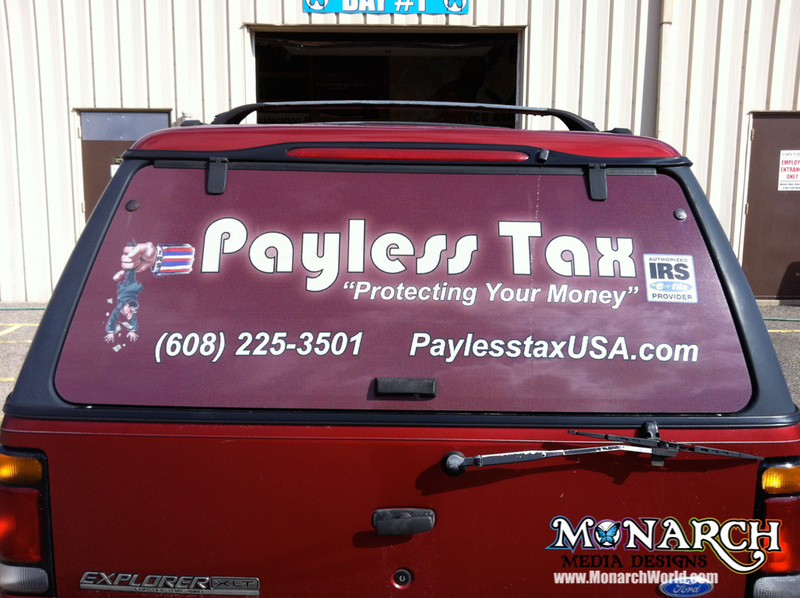 Rear window graphics are 100% removable within the warranty period, they are fully customizable, cheaper than a vehicle wrap, don’t damage your vehicle like magnets can, are allowed in most leasing contracts, and most importantly, it draws attention to your vehicle to help get your company noticed. 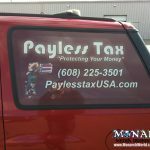 Is there a laminate option for window graphics and do I need it? 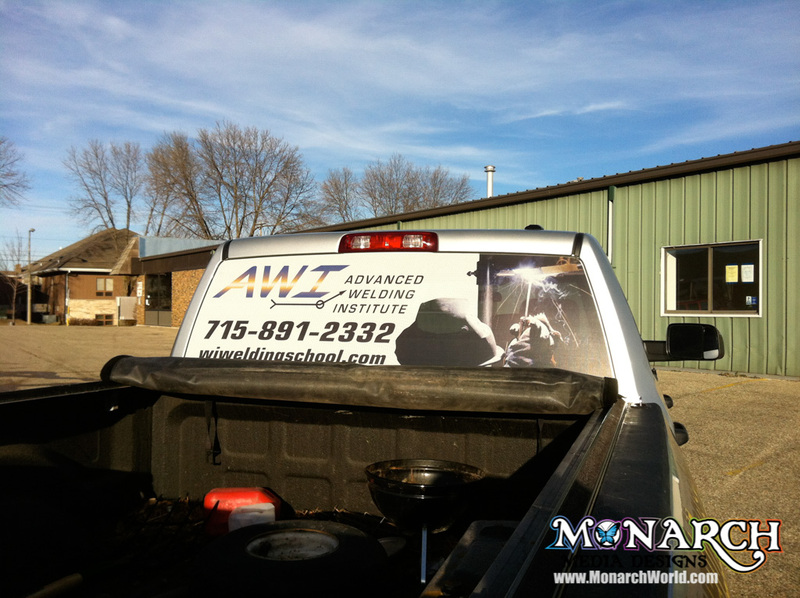 Lamination is apply a clear vinyl (laminate) to the graphic side of the printed vinyl. 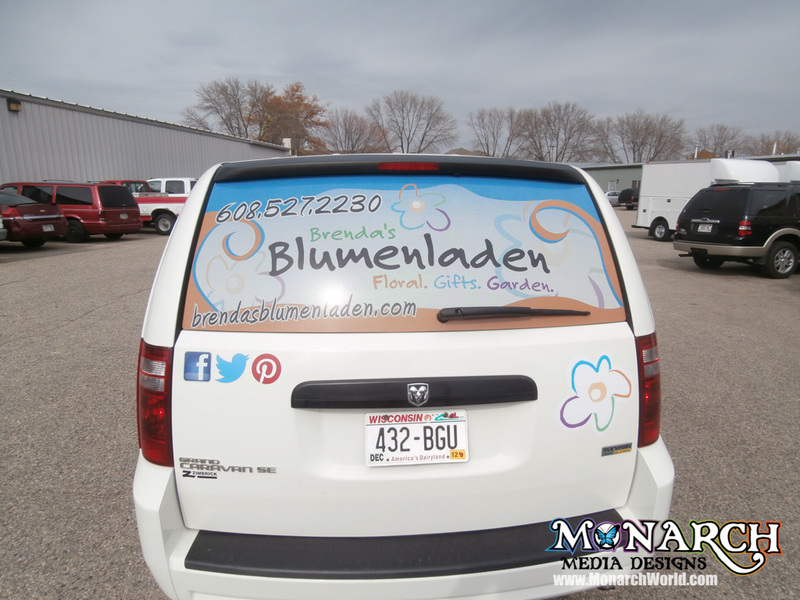 Laminate is used to protect the ink on the vinyl from scratches, keep it clean, and prevent UV rays from making the image on the graphic from fading. Also, on rainy days, the rain can tend to catch in the tiny holes and make it a little challenging to see out. 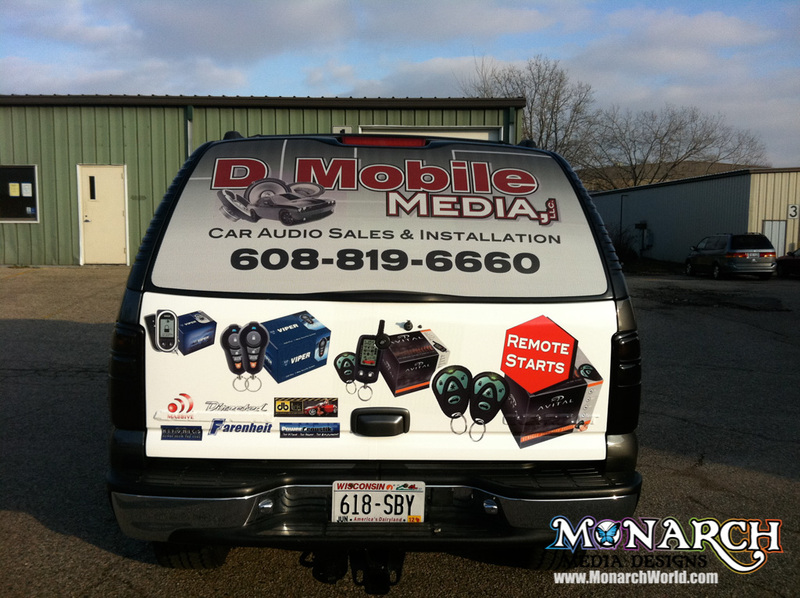 If you are looking for long term use, we would recommend laminating to help preserve the graphics. 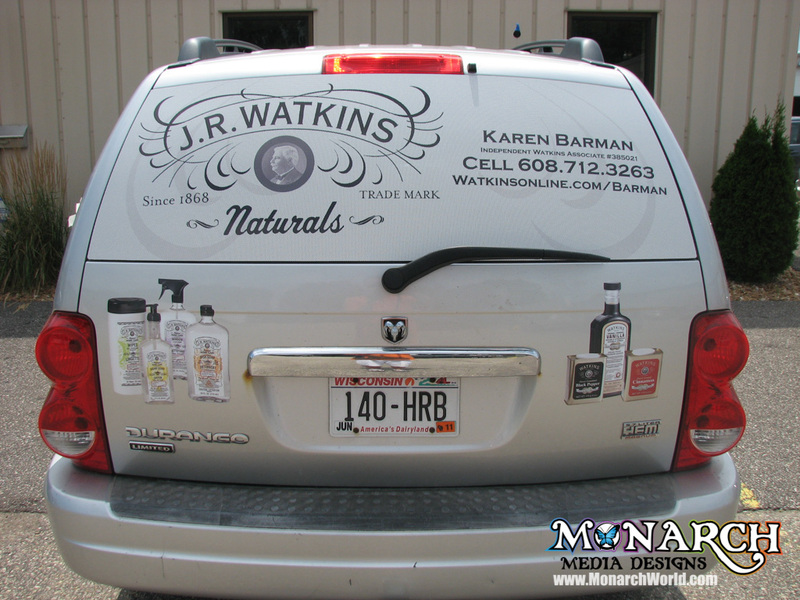 Short term graphics (less than 6 months) don’t necessarily need to be laminated. 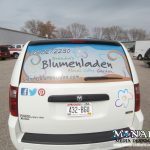 In the case of fleet graphics or for a small businesse where you will have the same design on the graphic for a long time (3-5 years), it’s worth it to have the window perf laminated. It is completely up to you. 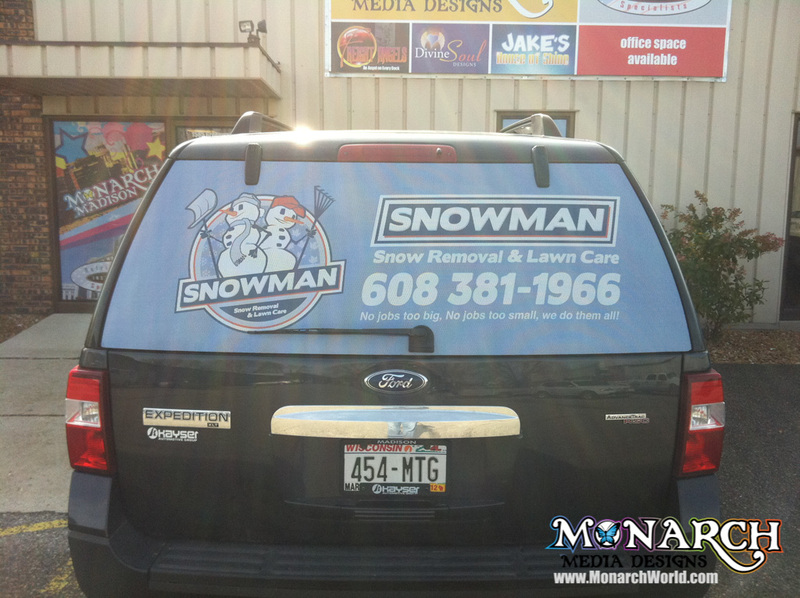 If you do not laminate, you may find yourself coming back a few years later to have the windows touched up. 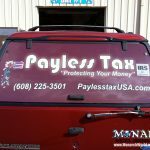 Will a rear window graphic damage my vehicle and is it easy to get off? 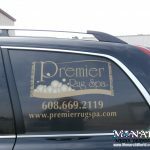 Perforated window graphics stay on well when they are in use and come off easy when it’s time to remove. 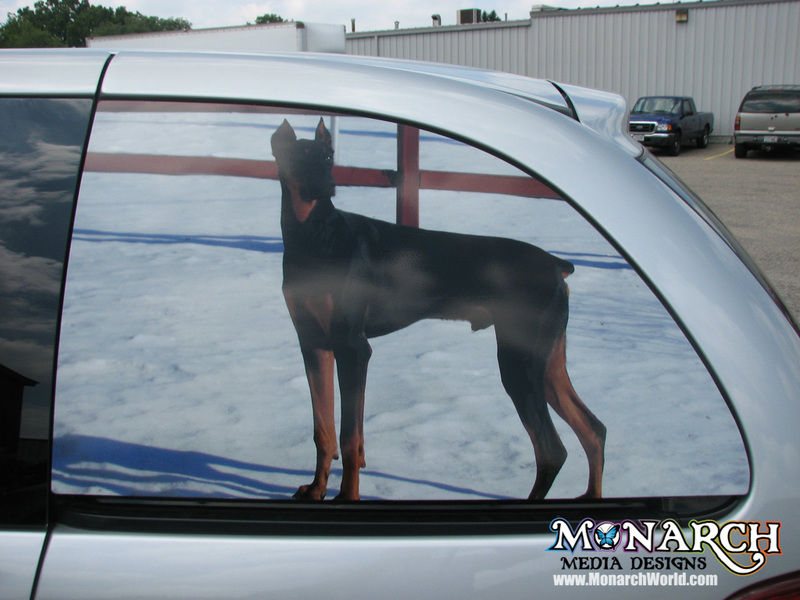 You can use a little bit of heat from a heat gun (or sunlight if it’s a hot day), then you are able to peel the graphics off. 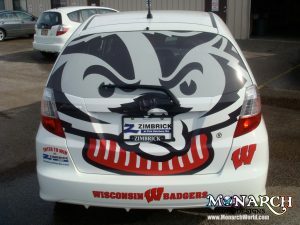 This will not harm the window whatsoever. 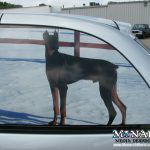 The smooth nature of glass allows for the vinyl to be easily removed, leaving no residue if removed within the 2 year warranty period. 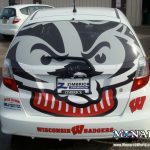 Do I need to wash my vehicle before I bring it in for installation? Absolutely. You should wash your car the day or the day before you bring your vehicle in for installation. Especially if it is really dirty or caked with dirt or bugs. 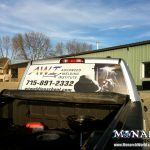 Not only is there an additional cleaning fee of $50 if you don’t, but if you didn’t wash it at all, you’d have bits of dirt and debris under the vinyl that would stand out when the installation is completed. 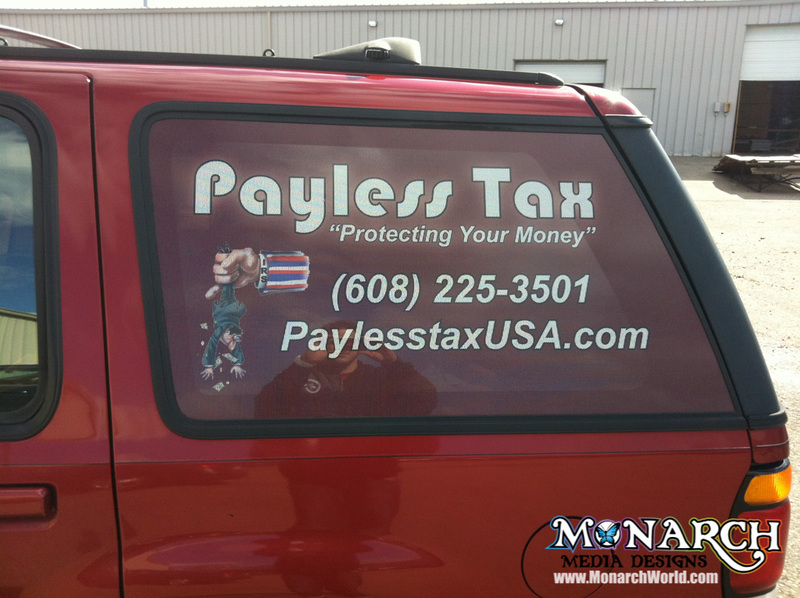 Avoid this problem, save yourself some money, and lightly wash the vehicle. 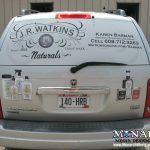 You can take it to a cheap gas station car wash.
How long will it take to install rear window graphics on my vehicle? 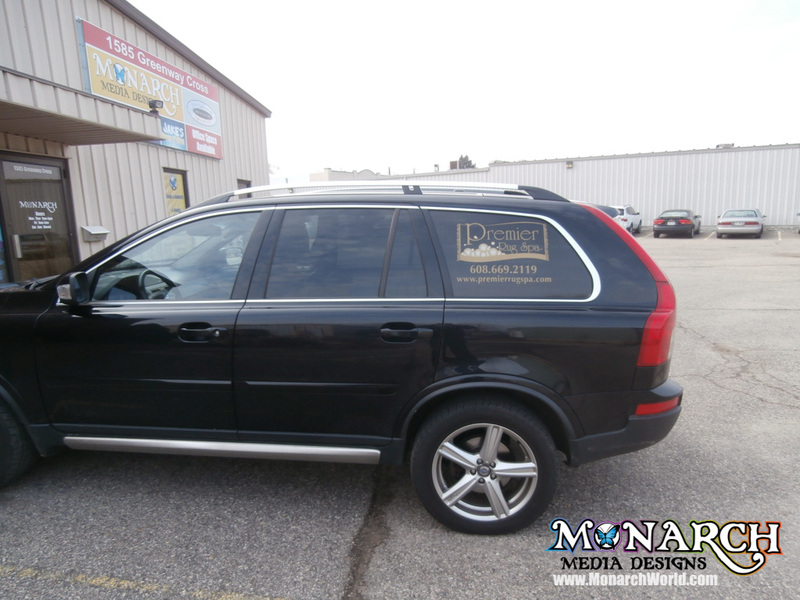 Plan for about 30 minutes, however it can vary from vehicle to vehicle based on square footage of the window.